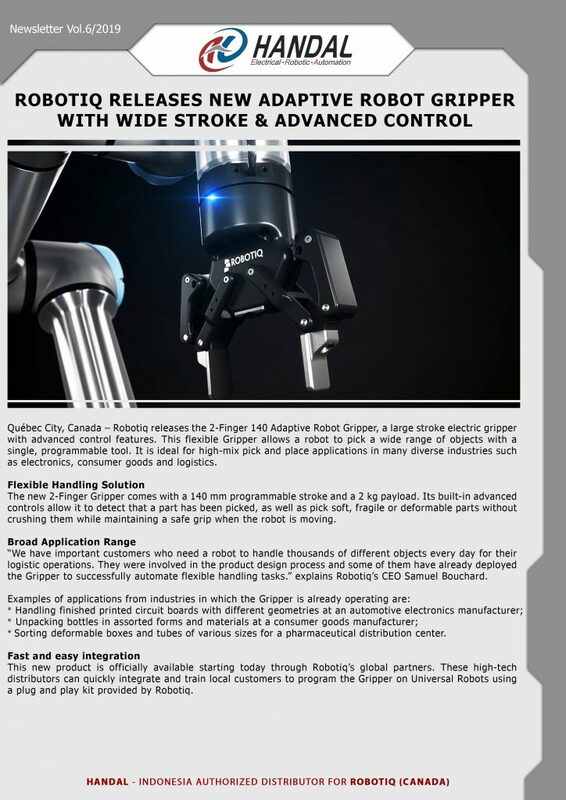 Québec City, Canada – Robotiq releases the 2-Finger 140 Adaptive Robot Gripper, a large stroke electric gripper with advanced control features. This flexible Gripper allows a robot to pick a wide range of objects with a single, programmable tool. It is ideal for high-mix pick and place applications in many diverse industries such as electronics, consumer goods and logistics. The new 2-Finger Gripper comes with a 140 mm programmable stroke and a 2 kg payload. Its built-in advanced controls allow it to detect that a part has been picked, as well as pick soft, fragile or deformable parts without crushing them while maintaining a safe grip when the robot is moving. “We have important customers who need a robot to handle thousands of different objects every day for their logistic operations. They were involved in the product design process and some of them have already deployed the Gripper to successfully automate flexible handling tasks.” explains Robotiq’s CEO Samuel Bouchard. * Sorting deformable boxes and tubes of various sizes for a pharmaceutical distribution center. This new product is officially available starting today through Robotiq’s global partners. These high-tech distributors can quickly integrate and train local customers to program the Gripper on Universal Robots using a plug and play kit provided by Robotiq.